Whether you’re fishing, boating, swimming, water-skiing, sailing or just laying around on the sandy beaches, you’ll find the lakes of the Parkland hard to beat for summertime fun. East Blue Lake is the clearest of all Duck Mountain Provincial Park’s spring-fed lakes. On a clear day, you can see the bottom of the lake down to 18.5 m (60 ft.). Enjoy swimming or boating, or make use of the Duck Mountain trail system for hiking. East Blue and Childs Lakes are among Manitoba’s finer scuba diving lakes. Facilities include a campground and overnight accommodations, supply store and gasoline. Located at the junction of PR366 and PR367. Open year-round, Childs Lake is accessible by road and offers fishing for lake trout, northern pike, splake and walleye. Most services are available at the lake, including boat and canoe rentals, gas, guide services, fish processing, tackle, bait, and licences. Located in Duck Mountain Provincial Park. 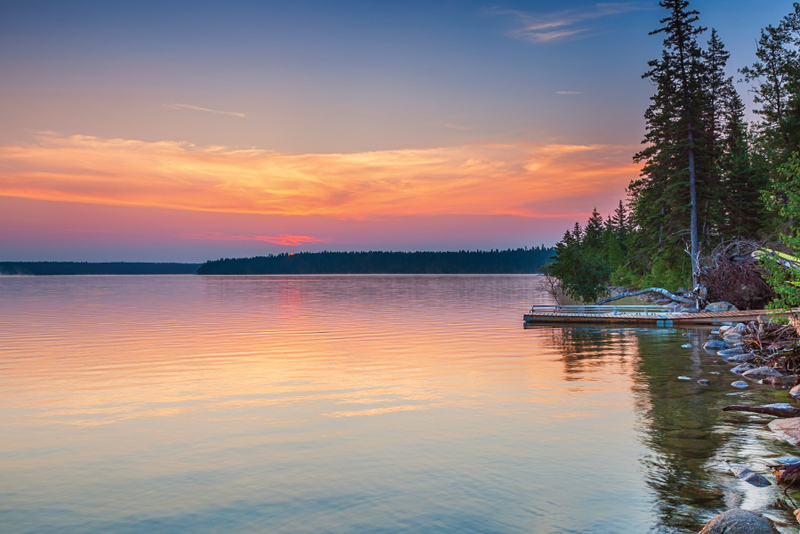 Visit Clear Lake in Riding Mountain National Park. Bring your own boat, kayak, canoe, or paddle board and explore this national park by water. To rent equipment, visit Friends of Riding Mountain office or go to nearby Onanole. Help keep Riding Mountain National Park’s lakes clean by getting your mandatory aquatic invasive species inspection. Easy-to-control 14-foot Jon-boats with 55-lb thrust electric motors perfect for fishing aerated trophy trout lakes can be rented from two Parkland locations: one in Rossburn and one in Roblin. The very mobile boats can be picked up or delivered to a number of nearby lakes, and even transferred mid-day from one lake to another if desired. Rods, tackle and a number of other gear can be arranged for the light-travelling avid angler passing through or families who want to try out fishing for the first time. Visit parklandsboatrentals.ca to book a rental online.